Web.com Sitebuilder Review: Helping You Fake It Since 1997. Can It Still Keep Up? Need a new website, digital marketing help, e-commerce guidance and web hosting? 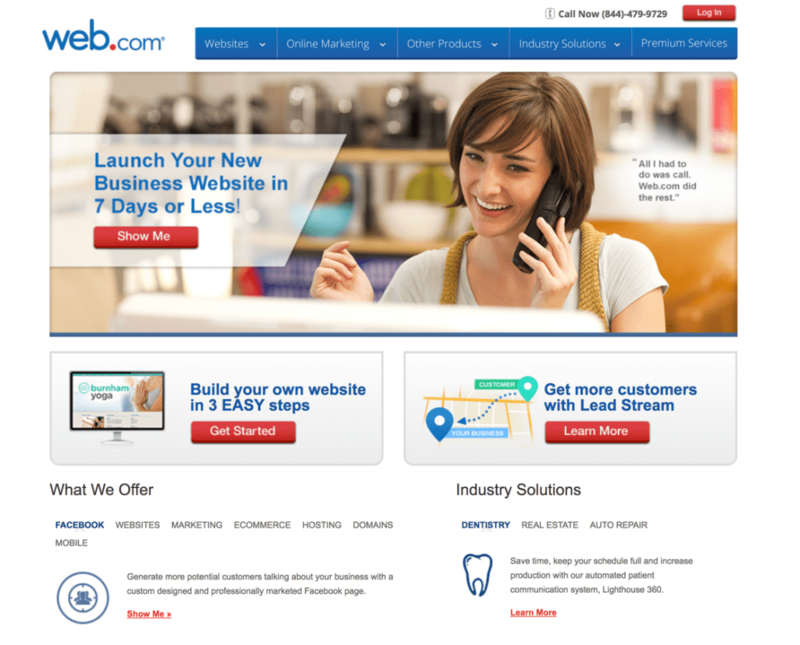 Read our review of Web.com to find out if this “one-stop-shop” fits your needs. Founded in 1997, Web.com focuses on the needs of small businesses and provides custom web design and marketing solutions to over 3 million customers around the world. They also offer services related to online marketing, domain names, web hosting, email, and security. Some of Web.com’s solutions are targeted toward both online and physical retailers. For brick-and-mortar businesses, Web.com offers relevant merchant services such as payment processing. Web.com partners with other web solutions companies, such as Network Solutions, Register.com and 1ShoppingCart. If Web.com doesn’t offer a particular service you’re looking for; there’s a good chance that one of their partners does. How Does Web.com Compare to Competitors? Does Web.com offer a free trial? How much does the Web.com site builder cost per month? Is Web.com a good choice for my e-commerce business? What does Web.com offer small businesses? Web.com’s tagline is, “You say it. We build it.” Their flagship offering is custom website design, and if you’re looking to outsource the entire web development process, Web.com might be a good fit for your company. 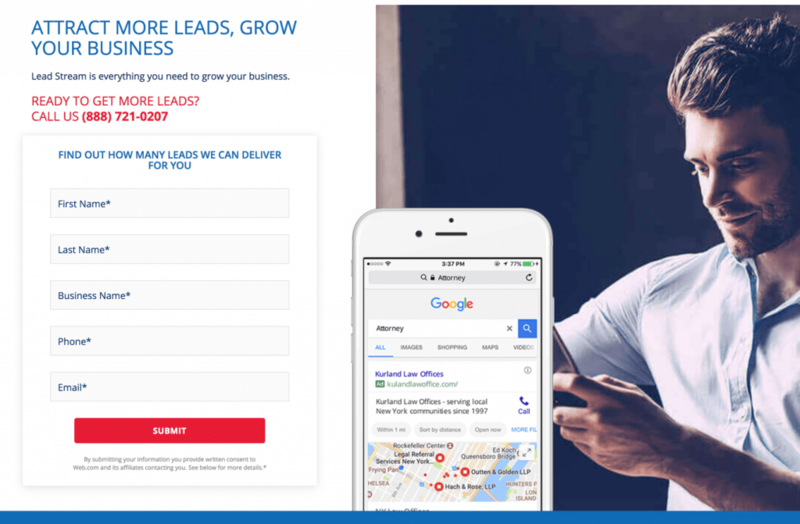 The Web.com homepage shows they have services to help small businesses grow their leads. The beginning of the process involves an in-depth consultation between you and Web.com’s representatives, who will speak to you and ask you a host of questions to learn about your business, determine what your needs are and how Web.com can meet them. Once Web.com has an idea of what you’d like, they will have the first draft of your site ready for your review within eight days. If you’re unsatisfied, they’ll work with you to refine the design until it is exactly what you want over the 30-day period (where day one is the day on which you had your consultation). Need a Facebook and Instagram strategy? Web.com can provide a content marketing and advertising strategy to find and engage your “tribe” on these social media platforms. In addition to building your site, the Web.com team will take care of basic digital marketing, to drive customers to your site. Once you’ve set up your website, you need to make sure customers can find it. This is why Search Engine Optimization is key – when your site is optimized, it makes it easier to rank in organic search results. They will submit your site to search engines and local directories on a monthly basis to increase the likelihood that your site gets found by your target customers. Web.com also maintains your Google business page and presence on sites like Yelp. You’ll also receive monthly reports to make sure that your business stays visible to users of over 100 search engines and directories. Creating a local listing for customers nearby; a must-have feature for businesses with physical locations. Map placement is included in the local business listing option. Lead generation is core concern of small business. 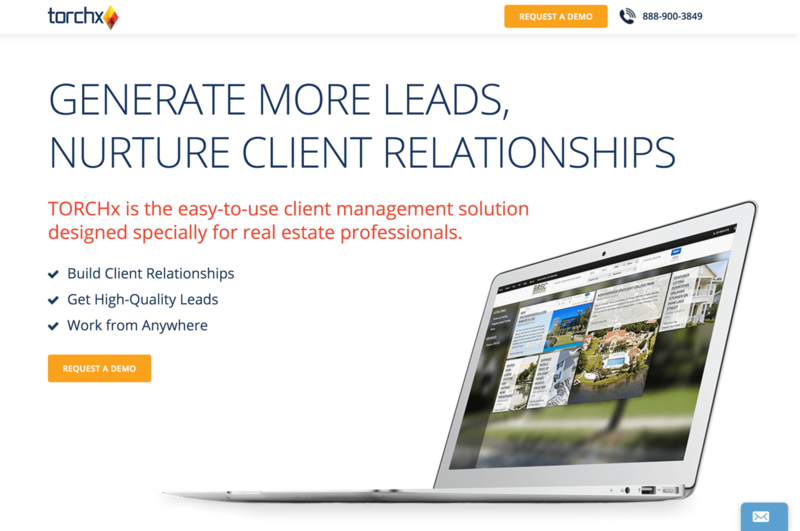 Web.com offers services to help you acquire more leads. Their lead marketing strategies include automated email campaigns, special offers and paid search advertising along with lead tracking. In addition to SEO, social media marketing is another way to spread the word about your online business. Note that these are add-on services, not included with the basic site builder plan. Web.com’s social media tools are comprehensive. Their staff will research your target customers on Instagram and Facebook and develop tailored ad campaigns. If you don’t have a Facebook page, they’ll even set up one for you and come up with original content for your target audience. Included with your package are analytics tools to see how your site is performing, what is working well and generating leads and conversions, and what could be improved (this includes statistics based on the device — sometimes user experience on a larger device like a laptop differs significantly from user experiences on mobile devices). If your site needs to be updated at any point, Web.com will do it on your behalf. You can also opt for monthly review phone calls with a Web.com marketing professional. If you ever need assistance with things like domain name renewal, web hosting, email, digital storage, or anything else related to the technical side of your site, you can request consulting services. In addition to building you a custom website that can be used with any hosting server or content management system, Web.com offers an explicitly WordPress custom design package where they build your site using WordPress, the most popular content management system in use today. The WordPress package is very similar the package that gets you design services for a site that works with whatever website solution you’re using. The biggest difference, however, is the inclusion of WordPress-related services in this package, such as managed security updates and security auditing and monitoring. While Web.com offers WordPress hosting, you might also consider web hosts optimized for WordPress. WordPress recommends Bluehost, SiteGround, and DreamHost. Criteria for recommendation includes updated software and these hosts promise increased WordPress site speed and performance. Starting in July 2018, Google is planning to penalize slower sites. Google reports only very slow sites will likely be impacted but it’s worth making sure your website loads fast to avoid being pushed down the rankings. Getting your site up and running in a week or less is a service feature offered by Web.com. 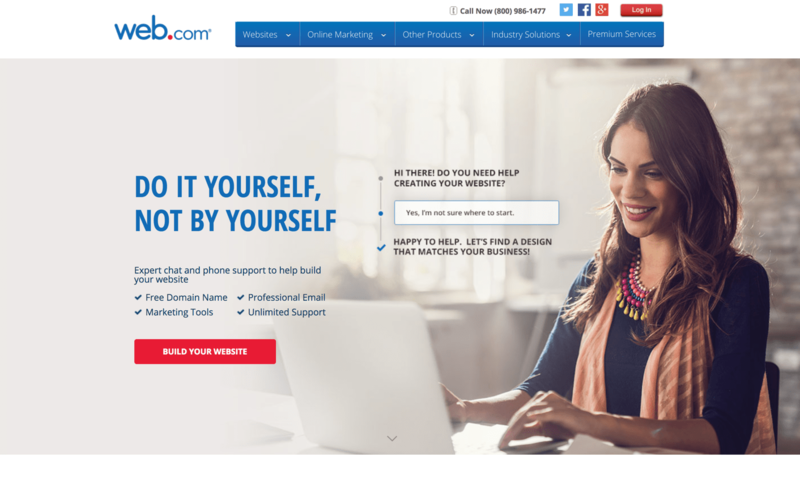 Web.com’s competitive differentiator is hinted at in their tagline: “Do it yourself, not by yourself.” They give you “unlimited access” to a website coach to advise you as you use their simple DIY-builder. Web.com also offers a guided DIY site building tool. Let’s see what it’s like to use the site builder. You can begin by clicking on the “Get Started” button prominently placed on the homepage for the site builder. The first thing you’ll be asked to do is to choose your free domain name. If you already have a domain name, you can use it instead of registering for a new domain. Once you have chosen a new domain name or provided a domain you currently own, you’ll be asked to choose a website builder subscription package. You have three options. Website Builder: aimed toward individuals or small businesses just getting started with a website, this package gets you a free domain name, access to hundreds of design layouts, rights to thousands of stock images you can use on your site, and access to the do-it-yourself website builder. Website Builder and Online Marketing: this package is aimed at small businesses looking to grow their online presence. In addition to everything in the basic package, you get a business profile in dozens of local search engines, assistance with submitting your sites to the major search engines, and SEO consultation services with Web.com’s SEO experts. Website, Marketing, and Store: if you’re a business that wants to conduct business online, this package is for you. You get everything included in the two lower-tiered packages, a product catalog that lets you display up to 500 products, and email marketing tools. Once you’ve purchased the package that best fits your need and has access to the site builder, you’ll get step-by-step instructions that walk you through the process. The first step is to select one of the hundreds of templates offered by Web.com. This forms the foundation of your site so that you can easily create a professional-looking site (even without design experience or technical knowledge). 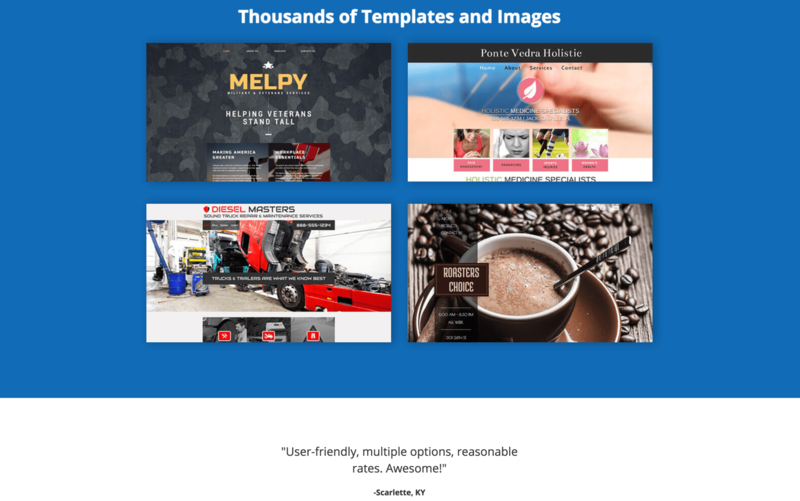 The do-it-yourself website builder comes with hundreds of different templates to choose from, and a bank of thousands of images. As the number of people browsing on mobile devices continues to climb, your website design must be responsive. Web.com comes with mobile-friendly designs. You have several options when it comes to working with the Web.com team. If you don’t have much experience in coding, it’s an ideal solution. Website builders do offer fewer options for customization. Once you have selected a template, you’ll need to update it so that it reflects the needs of your business. You can easily change the copy, upload your pictures (or use any of the thousands of stock images on offer), and move things around as you see fit. The drag-and-drop functions of the editor make doing all of these things easy. Regardless of which package you choose, you get unlimited storage, so you can create as many pages as you need. You also won’t have to worry about running out of space for the documents, photos, and videos you choose to upload to your site. Once you have finished designing your site, you can easily publish it so that it can be viewed by others. Unlike other free website builders like Wix and Squarespace, there’s no free trial. Otherwise, the builder is comparable to Wix as far as templates and customization options. Squarespace offers more features than Web.com, but at a higher price point. If you’re looking to build an online store, the e-commerce website builder might be a good fit for you. When purchasing, there are several versions available from which you can choose. eCommerce Express: includes the ability to display up to 20 products, access to the online store builder, and business email addresses. On top of the monthly fee, Web.com charges a 2.5% fee on each transaction. eCommerce Standard: includes everything you get with the Express package (though the maximum number of products you can display goes up to 500 products), email marketing tools, and Google product submissions. On top of the monthly fee, Web.com charges a 1.5% fee on each transaction. When building your site, you can use a template selected from Web.com’s library of customizable e-commerce templates, or if you already have a design in mind, you can build your site from scratch. The setup wizard walks you through the entire site building process, so you don’t need to worry about forgetting certain steps or tasks as you build. Web.com’s e-commerce solution comes with email marketing options. Features include customer analytics to show customer’s shopping patterns and your online store’s most popular products. You can use the information to inform marketing tactics like rewarding customers with discounts, exclusive sale invitations or promotions. Web.com doesn’t appear to offer cart recovery, one of the most important e-commerce website features offered by most e-commerce platforms. Squarespace is one of many popular site builders for online businesses to offer cart recovery. GoDaddy’s GoCentral e-commerce solution comes with abandoned cart recovery, a free trial and is streamlined for customers shopping on their smartphones. 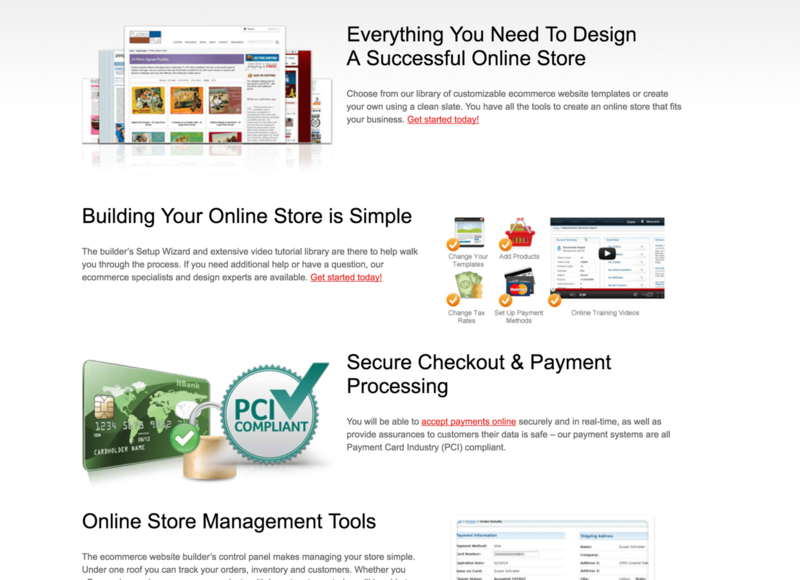 The Web.com website advertises PCI-compliant checkout and payment processing. You also get the following tools to make running your store easy. All of Web.com’s payment systems are PCI-compliant so that you can accept all major credit cards in your store. Note that fees for accepting credit card payments are separate from the transaction fees levied by Web.com for purchases. All proceeds from online sales are deposited into your bank account within two business days. You also get access to store management tools that let you track orders, inventory, and customers. For those who have purchased either the Standard or the Pro package, you’ll also get email marketing services. You can send promotional emails, upsell your products, make announcements, or offer discounts. 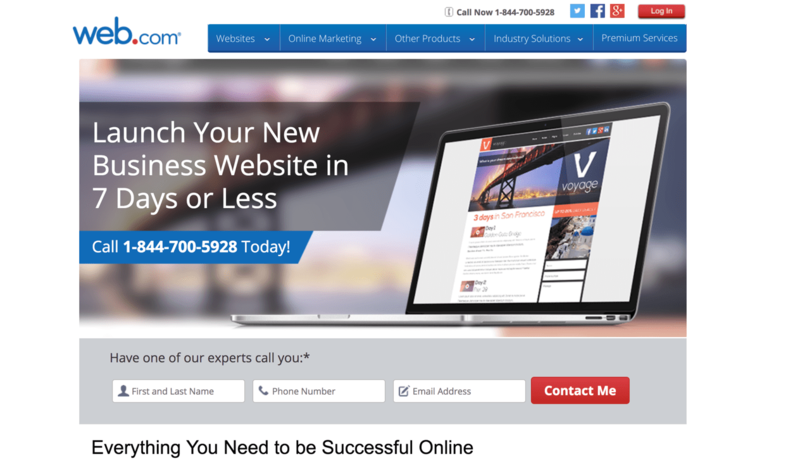 Web.com offers special website and marketing packages for those in the real estate, automotive repair, or dentistry business. These packages include tools such as online appointment booking and reminders; lead generation to drive inbound phone calls; and growth of your online reputation. The overall goal is to increase your business’s revenue. The included analytics and reporting tools allow you to track sales and online purchases. If you need information beyond what Web.com’s tools offer, you can easily integrate Google Analytics to gain additional information on the behavior of visitors to your site. If you need assistance with your site at any time, you can reach out to Web.com’s e-commerce specialists and design experts. One of Web.com’s more unique offerings is its gift card service. Web.com can help you get started with selling your custom gift cards. They’ll ship you physical cards to sell, including a display and store stickers. For additional fees, they can help you sell gift cards on your Facebook site or get an E-Onlinedata Merchant Account to manage your cards and keep track of what you sold and which cards are outstanding. You can process orders paid for using gift cards both in your physical store or online, and the included analytics tools let you know what your revenue looks like. If you want Web.com to build your e-commerce site for you, they offer a special where they will create you a website for free. However, the caveat to this is that you will be responsible for ongoing website maintenance, hosting, advertising, and other service fees in exchange for no upfront cost to you. Additionally, if you choose to end this option and you decide to cancel your contract, you relinquish all rights to your site. All custom sites come with inventory tracking and management tools, databases for things like customer details and addresses, SSL certificates, credit card processing, and integrated shipping calculators. You’ll also get one-on-one access to a designer draft tool so that the site Web.com builds for you is exactly what you want it to be. If you have an existing website that isn’t mobile-friendly, you may want Web.com to help you build a responsive site designed to work best on tablets or smartphones. They can do this and while making sure the responsive layout is based on your existing design. The build process occurs in three steps. You provide the URL to your existing site. Web.com builds a responsive site based on your current site. 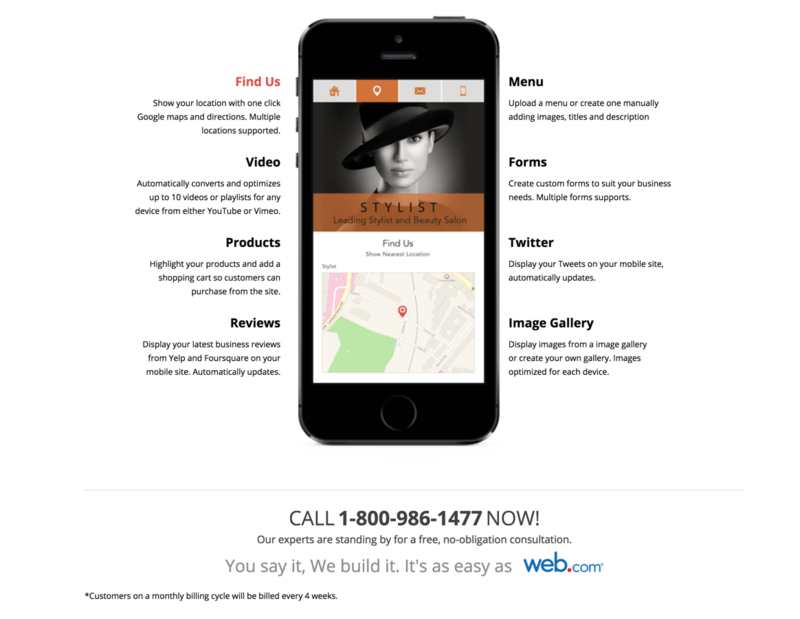 You customize the site Web.com has built for you with the mobile-specific features you want. For this service, you’ll pay a monthly fee to Web.com. Unfortunately, the site never mentions if this monthly fee is simply for the hosting of the mobile site, or if you get additional assistance (such as for updates if the information on your site needs to be changed). This Web.com graphic from their website advertises their mobile site features. While Web.com doesn’t list the cost of their custom web design packages on the description pages for these services, you can see what their current flat-rate is by going to the “Buy Custom Website Now” link in the footer of the homepage. On the other hand, Web.com is relatively secretive regarding the prices of their fixed-price, do-it-yourself web design packages, their e-commerce design packages, and their mobile design services. When you purchase access to any of the site builders or marketing services, Web.com displays a rate that they indicate is an introductory price valid only for the first month. You have to dig into the fine print to find out what the new rate will be once the initial month is over, and it’s significantly higher than the discounted introductory rate. There’s no free trial but you can cancel within the first month if you’re not happy with the product. If you don’t cancel you won’t be eligible for the money-back guarantee and you will be charged the much higher rate. Additionally, Web.com charges you every four weeks, though their copy says that it bills on a monthly basis. This means that, at the end of the year, it will have received the equivalent of thirteen payments. If you need help designing your site, you can get unlimited assistance from Web.com’s Website Coaches via live chat or telephone. You can get technical support by calling them toll-free. You can also open a ticket via their customer portal (which is accessible using credentials sent to you in the Welcome email you receive when purchasing a service). Unfortunately, we were unable to determine from the information on Web.com’s site what their support hours are, or what their guarantees are with regards to their customers getting help. While you can reach customer support by phone, there’s no live chat. Online some customers report negative experiences, including delays in responding to queries and slow business email hosting. Web.com maintains profiles on the following social media platforms: Facebook, Google+, and Twitter. The company is most active on Twitter and Facebook, so if you choose to reach out to them, these would be the platforms to use. In addition to their web design and marketing services, Web.com offers web-related products in which you might be interested. You can purchase them in conjunction with you design service, or as stand-alone offerings. If you need to register a new domain, you can do so with Web.com (even if you don’t need web design services or site hosting packages). Web.com offers three options for shared hosting. The options differ regarding how much disk space you’re allocated, the number of FTP accounts, and email inboxes. All packages get unlimited data transfer, as well as a free domain name. They guarantee 99.99% uptime, and access to the site builder (so users who purchase hosting automatically get site builder access, but those who buy access to the site builder don’t necessarily get hosting included in their package). If you’re curious as to what people are saying about your business, Web.com’s reputation management software tracks all mentions of your business and collects the information into a single report that you review. Web.com tracks thousands of popular websites, and whenever they find a mention (positive or negative), they will notify you. They will also provide information on how often you’re mentioned in comparison to how often your competitors are. Web.com’s Take-a-Payment app allows you to integrate payment processing into your site. Customers can also pay the invoices you’ve sent or make donations to your company (this is especially valuable if you’re a nonprofit organization or a business running fundraisers on behalf of nonprofit organizations). Web.com offers a number of both do-it-yourself and custom web design services aimed at small business owners. Web.com also offers a host of web-related add-ons you might find useful, such as payment process, reputation management, and domain registration. All of these can be purchased independently or added to your site builder/custom site design service packages. If you’re the owner of a small business that already has a physical presence, you may be able to purchase merchant services, such as payment processing, for your physical store when you purchase digital services. Web.com offers solutions that meet both types of small businesses. Regardless of whether you’re looking to expand your web presence or get up and running with an online store, Web.com has the tools to help you meet your goals. However, Web.com’s site is quite confusing, so if you’re interested in working with this company, we recommend calling them directly to discuss your options. Web.com prides themselves on their fully-customized solutions, and calling them allows you to get answers to your questions based on the specifics you want from your website. Have questions about whether Web.com’s site builder is right for you? Read on for answers to the most commonly asked questions about this site building tool. No, they do not offer a free trial, which is offered by many other site builders. However, their packages do start at an (introductory) rate of just a $1.95 per month and you can cancel after the first month. Their basic web building plan starts at $1.95 for the first month, which includes a domain name, hosting, stock photos, and tons of template options. However, in “Pricing Details” you see the rate goes up to $22.95 per billing cycle after the first month. In addition, they bill every four weeks, not monthly. This means you pay 13 payments per the calendar year. So, the cost is really $24.86 per month for the lowest level site builder plan. 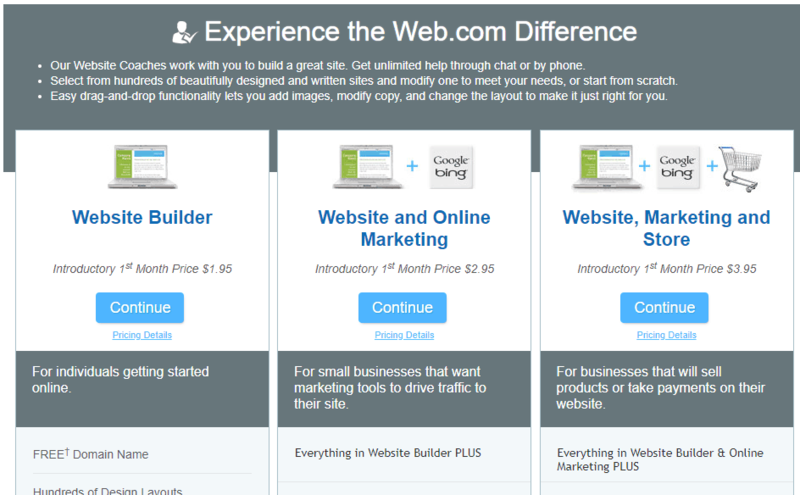 Web.com does offer e-commerce options in both the build-your-own and built-it-for you site builder options. It is limited, and only really appropriate for smaller sites looking to sell a few products, not large e-commerce sites who want enterprise-level features. Local business listings – sometimes referred to as local “citations” this is a critical (but often overlooked) part of helping your target audience find your business online. The Web.com blog which is a one-stop source for staying updated with need-to-know digital trends and how-tos. You are here: Home > Website Builders: All The Top Builder Brands Ruthlessly Reviewed > Web.com Sitebuilder Review: Helping You Fake It Since 1997. Can It Still Keep Up? Next: Cindr Sitebuilder Review: Bad For Developers. Here’s Why It Might Be Good For You.